Each year, Indian's poorest transform into rich, burnt orange oracles in Theyyam. But modernization might spell the festival's end. The gods of Malabar, India come out in December, and they gyrate among villages until the beginning of spring. In long, ornate dances, these sunset-orange apparitions swirl and sing and prophesy and condemn the wrongs of worldly rulers. 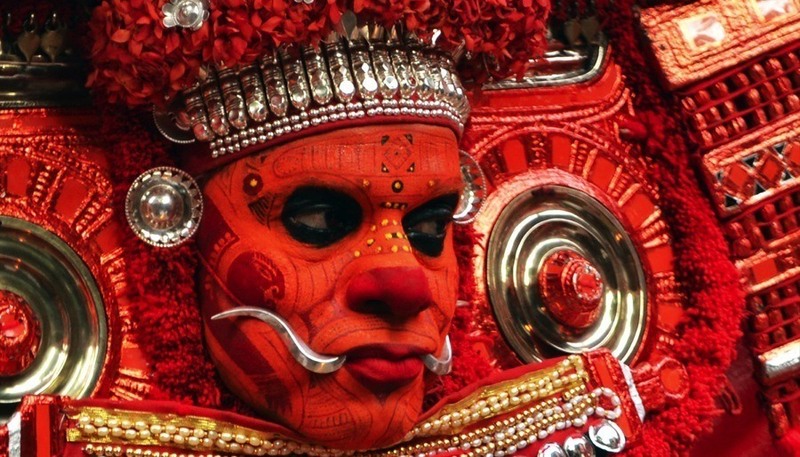 This is Theyyam — and its days may very well be numbered. The Theyyam tradition dates back centuries. While similar rituals take place in other parts of India, this Hindu rite of pirouetting incarnations is local to Malabar, a forest and wetland-soaked territory of India’s Kerala state, jutting right up against the Indian Ocean. In the traditional ceremony, the human oracle dons an elaborate costume of brilliant oranges, reds, and golds. This chenda, as it is called, can weigh around 90 pounds and stands nearly twelve feet tall when mounted on the shoulders of the performer. After prayers from holy men and other minor rituals, the oracle emerges before the crowds who have assembled and, flanked by drummers, begins the thottam, the sacred song and dance that transforms the human performer into an embodiment of the divine. People travel from around the region and across India to receive personalized blessings from these manifestations of the Hindu pantheon. 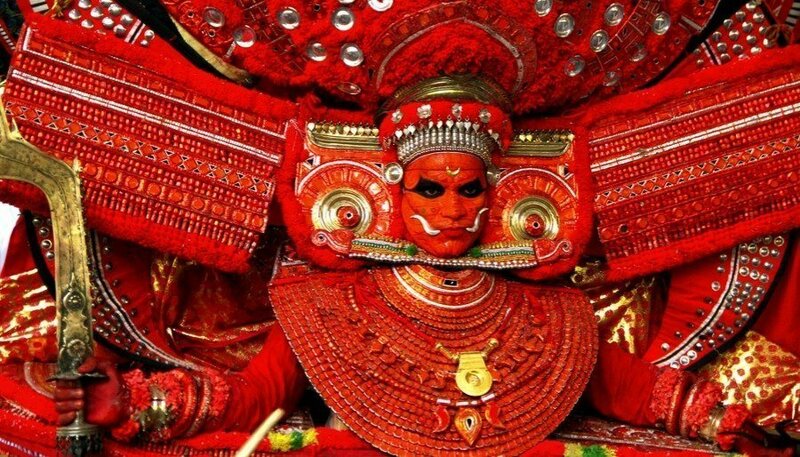 There are also traveling Theyyam troupes, often made up of families who received the traditions from their parents and grandparents as kids and have passed them down to their own children at the age of ten or eleven years old. These troupes go from village to village from December to February or March, bringing the apparitions of divinity with them. One of the most interesting things about the Theyyam tradition is the way it inverts the social hierarchy — at least on the surface. Only the low castes, including the Dalit or untouchables, have the right to be oracles. The priestly Brahmin caste is excluded. Instead, Brahmin queue up to listen to the inspired advice and prophecy offered by the divine incarnations. The Brahmins even kiss the oracles’ feet. The holier-than-thou bow before the untouchable. Such inversions are common throughout world cultures (even Halloween in the U.S. reverses good and evil for a night). In Theyyam, the strange injustice of birth is reversed, — that is to say, in a way that doesn’t permanently subvert the power of the elites. At the same time, the festivities are a reminder to those same elites to use their social position for justice. In Pottan Theyyam, for example, which is one of the most popular songs of the oracles, Shiva (one of the main deities of Hinduism) himself becomes a pauper. When a disgruntled Brahmin starts verbally abusing the god disguised as a serf, Shiva tells the man that enlightenment only comes to those who respect all human beings, regardless of caste. 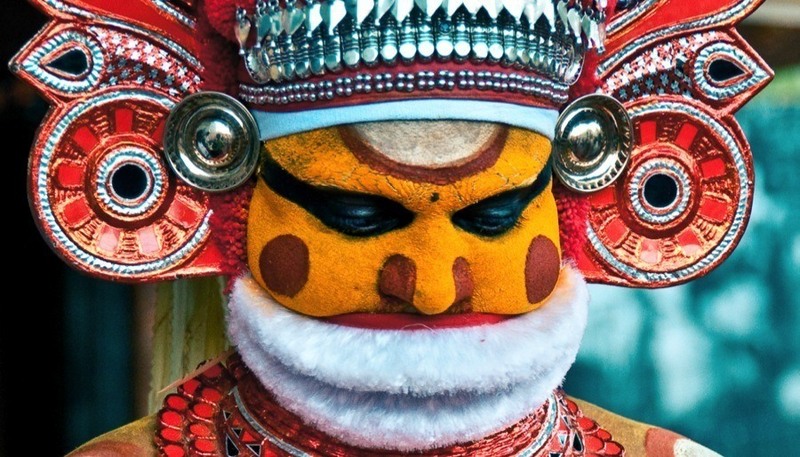 As India modernizes, the future of the Theyyam ceremonies stands in doubt. Performers get paid very little for their work, around $3 a day. Young people in Malabar, as they are around the world, are migrating to cities and choosing urban careers over the often brutal lives available to them in rural regions. In the process, old ways get left behind. In the coming decades, the Theyyam dances could follow countless other traditional rituals around the world down the path to obscurity. Nambiar is calling on UNESCO to give the Theyyam traditions World Heritage status. But so far his prayers have not been answered.